Okay, so you think i'm lying right? Not as expensive? How can that be? Gluten free bread is always expensive. I won't argue with you there. 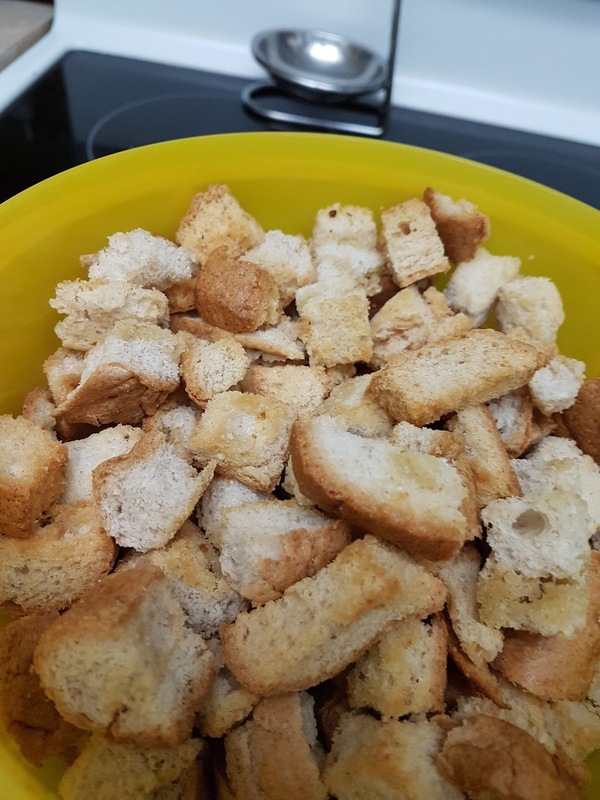 It is, and these croutons were not as cheap as regular croutons, but I certainly didn't pay full price. Basically, you are drying out the bread, so you don't need the freshest stuff. We went to Superstore to their bread rack and bought a package of 30% reduced gluten free hotdog buns that were about to expire off the shelf. You can do this with any type of gluten free bread. Spread some garlic butter made with margarine, garlic and Italian seasoning. Because these were buns, I sliced the buns first. Put in oven for 10 minutes, then checked periodically until golden. Turned off the oven, and let stand in oven for another 10 minutes. Now we are all ready for some gluten free Cesar salad with the Renees gluten free Cesar dressing we love!